Great stuff from a great American novelist. Jack Engelhard (Indecent Proposal... The Bathsheba Deadline... The Days of the Bitter End...) brings it as only he can in language that is economical, hard-boiled and fast-paced to uncover through the art of fiction the naked truth about a TV news personality who resembles someone we all know. Brilliant and elegantly done, Engelhard dishes the scoop on this "queen of Chick Power with legs to die for." What's it like to live under the glare of the spotlight, and to love after the lights go down? In Engelhard's masterful rendering, we follow the glamorous Marjorie Carmen's rise to TV news stardom and what it took to get there, and what it takes to stay there. She came along when network TV news was dominated by living but dull white males. We root for her, hurt for her, love with her, find fault with her, and are always fascinated by her. But she is only half the story. As she keeps winning, her husband, Rick, keeps losing. He's a failure. He must do something to prove he's worth keeping. The choice he makes leads to a fascinating result, and in taking us inside a teetering marriage, Engelhard is peerless. Watch for the third major character Engelhard adds to the picture – Ruben Franklin! This is a newsroom swashbuckler you'll never forget, just as you will never forget Marjorie Carmen, so fictitious, but so true. To know her, is to know our culture. This is a superb, thrilling novel that must be read. "Engelhard zeroes in on a news anchor who resembles Megyn Kelly. It's fiction, but WOW!" "Jack Engelhard's novels are filled to the brim with clear spirit, serious soul, and gritty honesty. His writing style is so light and bright it carries the reading in an effortless flow." "Engelhard writes with the sparseness of Hemingway and the moral intensity of I.B. Singer." "Jack Engelhard is a writer without peer and the conscience of us all." 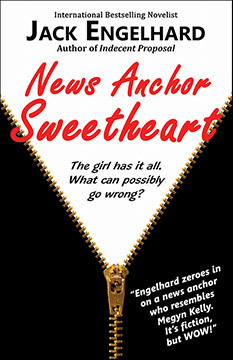 "News Anchor Sweetheart is a highly enjoyable, fast paced novel with engrossing characters that twist and turn their way through the seedy underbelly of broadcast journalism. Whether confronted by blackmail, tempted to infidelity, engaged in the quest for creative purity, or trapped by a lust for fame and success, Jack Engelhard’s characters are consistently posed with moral dilemmas and decisions--and it’s this moral undertow that compels the story. Delightfully, Mr. Engelhard has chosen to leave the final decision to us as readers, a risky move attempted by only the most confident of authors." Jack Engelhard is a leading American novelist whose bestsellers have been translated and celebrated worldwide. His works have been turned into smash-hit movies, notably Indecent Proposal. He has been hailed as an heir to Hemingway for the economy of his prose. He is the recipient of the Ben Hecht Award for Literary Excellence, among other laurels.